Back in 1933, Bernard Olson probably never dreamed that the little one stall garage that he opened with $125.00 would turn into the corporation that it is today. But, with the help of his family, friends, and community, Bernard was able to open Bernard’s Super Service in downtown New Richmond. His shop was located behind the Lowrey Hotel, and he rented it from Walter Beebe for $25.00 per month. As the years went by and Bernard’s business grew, it became evident that the Olson’s needed more room. 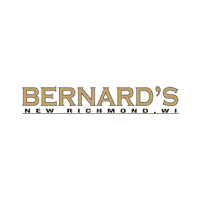 So, in 1974, Bernard moved the business to the north side of town, and renamed it Bernard’s Northtown – and here we are today. Many things have changed over the years, but one thing has remained the same, and that is our commitment to serving our customers as our #1 goal. Bernard had a knack for treating his customers as part of his family and established a reputation as a friend you could depend on. That tradition was carried on by Bernard’s son Dave Olson, whose home and heart has always been in New Richmond. Today BJ Olson, son of Dave Olson, operates the Chrysler, Dodge, Jeep, Ram dealership, but the sense of family doesn’t stop there. You will find two of BJ’s sons – Zach and Parker – in the Used Car Department, his son Isaac at the front desk, and his son-in-law Chase in the Sales or Finance Department. After being with Bernard’s for nearly 15 years, BJ’s brother Steve has extended his interest in the car business to a dealership in Sand Creek, WI. The staff at Bernard's Chrysler Dodge Jeep Ram strives to achieve excellence in all departments: from sales to finance, and service to parts. Our well-stocked new and used inventory of Chrysler, Dodge, Jeep, Ram vehicles are constantly being updated; your perfect car could be just around the corner! We offer competitive pricing on all Pre-Owned manufacturer products including Chevrolet, GMC, Pontiac, Buick, Lincoln, Mercury, Ford, Honda, Toyota, Nissan, and whatever else we may have in stock. We serve the greater Saint Croix area and the surrounding communities of Hudson, Stillwater, Woodbury, Eau Claire, River Falls, and the Twin Cities. Located in New Richmond, WI. at Bernard's Chrysler Dodge Jeep Ram, we offer new Chrysler, Dodge, Jeep, Ram vehicles in Greater Stillwater, MN, along with used cars, trucks, and SUVs by top manufacturers. Our sales staff will help you find that new or used car you have been searching for near Stillwater MN, Woodbury, Hudson, Eau Claire, and New Richmond. For years, our financial staff at Bernard's Chrysler Dodge Jeep Ram has offered expert advice for those seeking a great Chrysler, Dodge, Jeep, Ram vehicle loan or lease. Our service doesn’t stop there. Stillwater MN customers and St. Croix county customers can come in and take advantage of our knowledgeable Chrysler, Dodge, Jeep, Ram repair technicians and a fully-stocked inventory of Chrysler, Dodge, Jeep, Ram parts. You can reach Bernard's Chrysler Dodge Jeep Ram any time by filling out our contact form, by calling us at ​877-319-5859​715-318-5576, or simply visiting our Greater Stillwater, MN Chrysler, Dodge, Jeep, Ram dealership at 510 Deere Dr, New Richmond, WI, 54017.